I guess that means people think the jacket looks good. 🙂 Well, let me tell you, it performs well too – both in the rain and on my bicycle! Because I’ve received so many inquiries about the REI Rhyolite Rain Jacket over the past several months, I thought it would be beneficial to write up a quick review of this lightweight and very compact waterproof rain jacket from REI. But rather than show you the same boring product images of the jacket that you can easily find on the REI website, I thought it would be best to share photos of the jacket in use on my recent 3-month-long bicycle ride across Portugal, Spain, France, Andorra, Norway and Sweden. 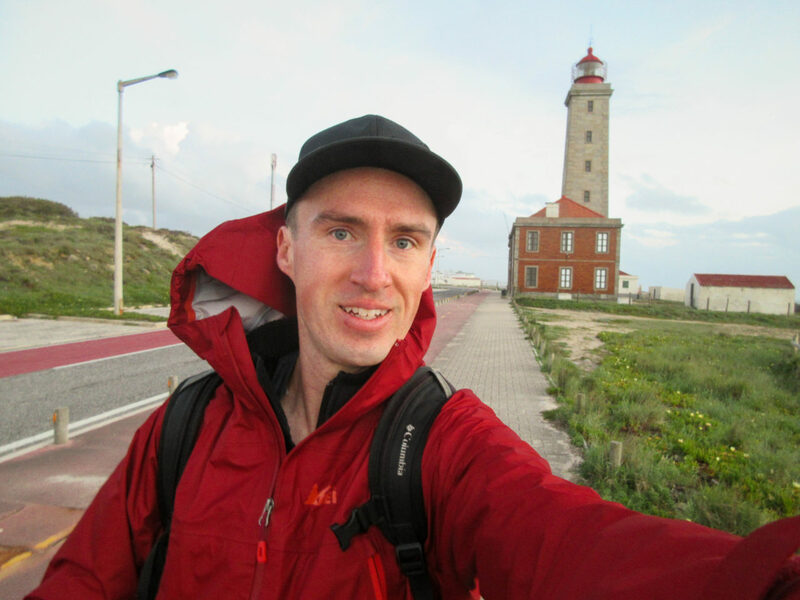 In the photo above, you see me standing in front of the Farol Penedo da Saudade lighthouse in São Pedro de Moel, Portugal on the very first day of my bike tour in Europe this summer. I expected Portugal to be hot and sunny during the summer months, so I was a little surprised to be wearing my new rain jacket on the first day of the trip. At the same time, I was glad to have spent the money on this high-quality waterproof rain jacket, as it certainly came in handy throughout my cycling adventure in Europe this summer. The truth is, I’ve owned lots of other rain jackets in the past, but all of them, after a while, would lose their waterproof features and eventually start to leak – meaning that when it rained, I got wet. Not something you want in a quality rain jacket! So, when I went looking for a new rain jacket this year, I knew I wanted to find something that was 100% waterproof and would retain its waterproof features over time. I also wanted something that was lightweight (because I’d be carrying the jacket with me on my bicycle and in my backpack whenever I stepped off my bike at the end of the day) and something that didn’t take up a whole lot of room. In other-words, I wanted to find the very best rain jacket I could find… without having to break the bank. The truth is, I looked and I looked for a rain jacket that I liked, but after several months of looking, I still hadn’t found a rain jacket that would work well for my needs. In fact, it wasn’t until I was less than a week away from leaving on my 3-month-long bike tour in Europe this summer that I visited my local REI store (something I had done several times before over the previous 3-4 months) and I noticed a new rack of rain jackets that hadn’t been there before. While the REI Rhyolite Rain Jacket currently comes in five different colors (black, blueberry, quiet shade (gray), red hot and wild burgundy), my local REI store only had two of the available colors in stock – black and wild burgundy. While I loved the look of the wild burgundy jacket, they didn’t have that color option available in my size. So, I tried on the black REI Rhyolite Rain Jacket, liked it, bought it and went home. But before I could even remove the jacket’s tags, I had a change of heart and I decided to exchange the black jacket for the wild burgundy one I liked so much at the store. It took a few days to have the burgundy jacket sent to me in the mail, but I arrived just a day or two before my flight to Europe. So, yes, the jacket you see me wearing in all these photos is a size medium Rhyolite Rain Jacket from REI in the wild burgundy color choice. I know it looks red, but it’s actually a bit darker than it looks, so the wild burgundy name fits it well. The jacket folds up to a super small size. You can stuff the jacket into a corner of your backpack or the pocket of one of your panniers and you will hardly notice that it’s there. Unlike so many other rain jackets out there, the REI Rhyolite Rain Jacket is incredibly compact when it’s not in use. The REI Rhyolite Rain Jacket is lightweight. It’s eVent® DValpine™ fabric is not as thick as what you might be used to seeing on other outdoor rain jackets, but that’s a good thing, because it makes the jacket light and easy to carry. The weight of the jacket on a bicycle is almost insignificant, and in a backpack you hardly notice that it’s there at all. The Velcro straps on the wrists of the jacket allow you to push the sleeves up to your elbows when the weather is warm, or buckle them down tightly to your wrists/gloves when the weather is especially cool. This is great for regulating your body temperature as you cycle, walk or climb. The large side vents/pockets allow you to regulate your body temperature as well, so you don’t ever get too hot or too cold. Open the vents up wide for a nice gentle breeze, or zip them to the top in cooler/wetter weather conditions. Finally, the Rhyolite Rain Jacket is actually rainproof. Unlike so many other rain jackets that claim to be totally waterproof or 100% water-resistant, the REI Rhyolite Rain Jacket is really built to withstand serious downpour conditions. I was able to test this out for myself several times this summer, and each time it rained, I stayed dry underneath the jacket. Which, frankly, is what you really want when you spend money on a rain jacket of any kind. Because the jacket is so thin, it’s not really meant to be worn on its own in very cold conditions. The REI Rhyolite Rain Jacket is really just a thin rain shell that should be worn with a warmer fleece-like jacket underneath it if you plan to be traveling in areas where the temperatures might dip. The jacket isn’t really designed to be worn on a bicycle (it’s more of a hiking/backpacking jacket), so the hood on the back doesn’t zip up very well when used with a helmet. This isn’t much of a problem in small rain storms, where it’s easier and probably more comfortable just to cycle with the hood of your jacket in the down position. But in heavy rain storms, when you might want to put that hood up, you’ll find that it’s not very easy to slide the rain hood over your helmet and/or keep it from blowing off your head as you ride. The pockets on the jacket are almost non-existent. In fact, the pockets are really more like vertical vents build into the front of the jacket. You can store lightweight items in there, but it’s pretty awkward to place your hands inside, as the vented side-pockets are located a bit higher than they would be on similar outdoor sports jackets. Finally, because the jacket is really just a lightweight rain-shell (and not a complete 3-piece rain jacket like so many others you find in the sports/outdoor industry), the REI Rhyolite Rain Jacket is not the most comfortable jacket in the world. Like so many other waterproof rain jackets, it’s fabric has a thin, crinkly plastic feel to it. The fabric works well to shed water, but probably won’t be used to win any awards for comfort anytime soon. Overall, I really like the REI Rhyolite Rain Jacket. In fact, it’s the best rain jacket I’ve ever owned and I would wholeheartedly recommend it. The jacket not only worked great on my recent three-month-long bicycle ride across Europe, but it finished the trip looking like new and, most importantly, is still 100% waterproof. 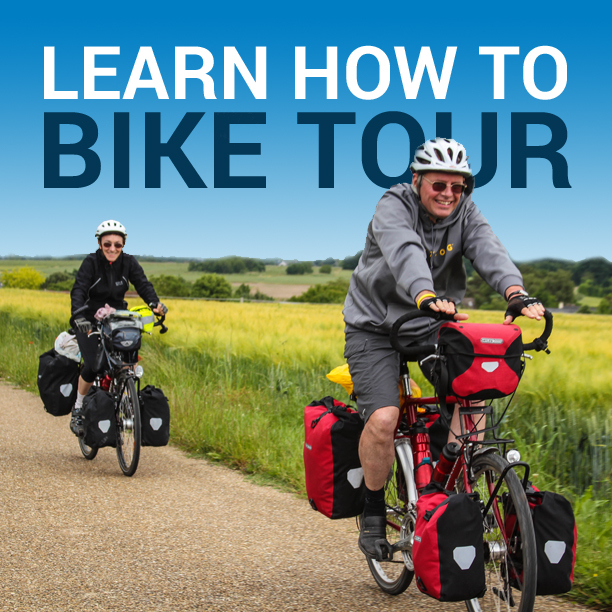 This entry was posted in Bicycle Touring Pro Articles, Clothing, Featured Articles, Featured How-To Articles, Product & Service Reviews, Uncategorized and tagged Clothing, cycling jacket, jacket, rain, rain jacket, rain jacket review, rei jack, rhyolite, rhyolite rain jacket, waterproof jacket, winter.